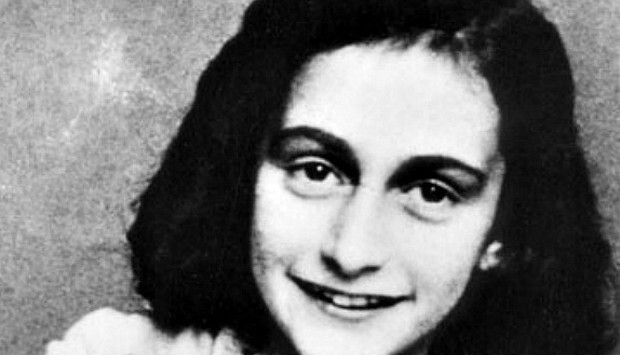 Too often “The Diary of Anne Frank” is seen as a blunt object, and that’s too bad. It is an educational tool after all. 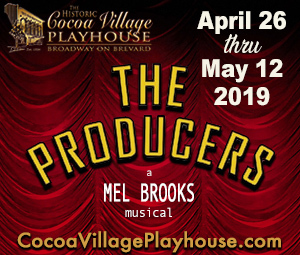 But under Bryan Bergeron’s skillful direction – and he’s no stranger to staging this material – Surfside Players’ production envelopes us, forces us to be willing flies on the wall of the Frank house. 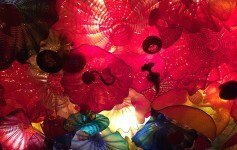 I was captivated…made a member of this family….even when I didn’t wish to be. This isn’t easy stuff. Thankfully Bergeron gives us the reason why this play works: Family and heart…even humor – and without any Hallmark Channel sap. All cast members cleverly work together to make us understand this; and with little sense of telegraphing. Yeah, you’ll laugh, even. We are made to feel apart of this family, no matter how many times you’ve seen it. 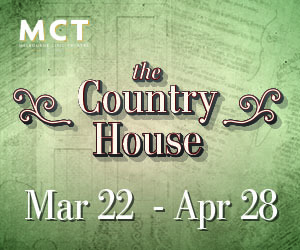 With a script by Frances Goodrich and Albert Hackett (newly adapted by Wendy Kesselman) it of course is based on diary entries of Anne Frank, reportedly written while she was in hiding for two years with her family during the Nazi occupation in the Netherlands. We know what eventually happened Anne Frank. The subject matter is harsh; the production is not. 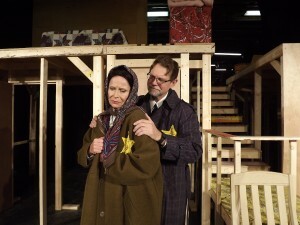 Susan Teplica and Kirk Murphy in “Diary of Anne Frank” at Surfside Playhouse. Photo by Leslie McGinty. 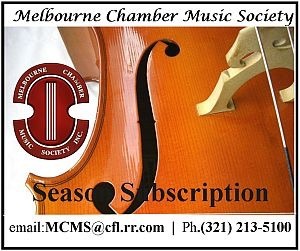 At the beginning, the character of Anne Frank is dressed in red – from head to toe, a call back to the little red-coat girl in “Schindler’s List,” especially considering Bergeron’s choice to open the show with the achingly painful strains of Itzhak Perlman. Beautifully horrifying. 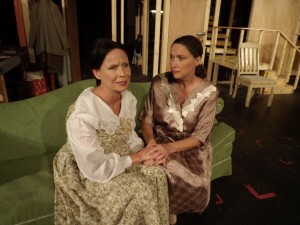 Susan Teplica and Micaela Cunninngham in “Diary of Anne Frank” at Surfside Playhouse. Photo by Leslie McGinty. At one point, I wanted to stand up and cheer when Susan Teplica as Mrs. Edith Frank echoed that pent-up energy; and I sighed with relief when Scott Sutherland as Mr. Van Daan swooped in to offer needed comic, desperate relief. As Anne Frank, Emma Armenteros is brilliant and a joy to watch. She reminds us that Anne Frank was a real person who had/wanted a childhood . Ms. Armenteros’ performance is both seen and heard. Ahem. Armenteros’ recitations of Frank’s diary entries are especially chilling considering she comes off as a young person reading something she recently recorded in a hand held book; not quite grasping what’s to come. Armenteros splendidly avoids precocious trappings. No doubt people are looking for a break from election season and yes there are plenty parallels to be found as people try to make the best of unforeseen atrocities. You’ll see them. I’m not going into it here. Surfside’s production of “The Diary of Anne Frank” tells us the story we need to hear: This child’s tale/legend isn’t about understanding what happened. It’s about reveling in the possibilities of something explainable that shouldn’t have happened. 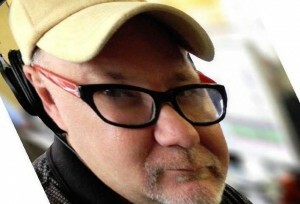 Bruce Hickman is a videographer, journalist and critic of theater, film and music. He left the Florida Today newsroom after…well…after a long time. DIARY OF ANNE FRANK runs through May 1 at Surfside Playhouse, 301 Ramp Road (by S. 5th Street), Cocoa Beach, FL. 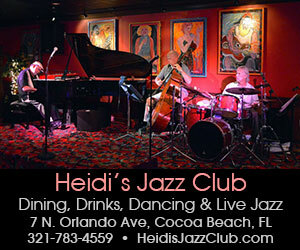 Curtain is 8 p.m. Fridays and Saturdays and 2 p.m. Sundays. 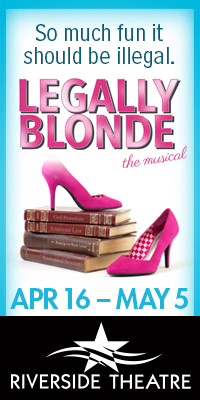 Tickets are $22 general, $20 seniors and military and $17 student. 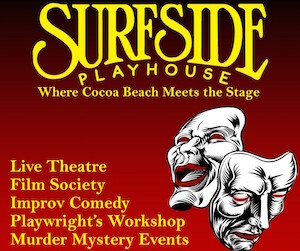 Call 321-783-3127 or visit SurfsidePlayers.com.